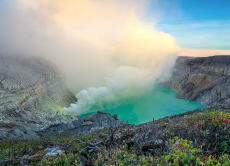 Ijen Expedition Tour are tour and trip organizer in East Java, especially for Bromo Sunrise Tour and Ijen Blue Fire Tour. We are based in East Java, in Jl. Raya Ijen, Banyuwangi. We have a simple, yet powerful mission: To make sure our customer is happy. This is a once in a life time must !!!!!!! The guides, their passion, their souls, the place, the experience, the people of Indonesia, it has been one of my most amazing experiences ! Also to see and admire the souls and strength of the miners, all my respect!!!! Bravo for this !! !